Halophytes are the flowering plants native to saline habitats. These habitats contain high salt, heavy metals and other toxic anthropogenic agents. To complete their life cycle in such harsh conditions, halophytes have developed different strategies like development of succulence, compartmentalization of toxic ions, synthesis of osmolytes, increase in activity of antioxidants and synthesis of compatible solutes. Halophytes have significant applied interests towards various agricultural and non-agricultural purposes besides for maintenance of ecological balance. Important bioactive metabolites can be derived from halophytic plant species for commercial value. In addition, halophytes can be utilized as alternative plants as they could be cultivated for food, fodder/forage, fuel and medicinal crops on saline lands with the help of salty water irrigation. Apart from tolerance, halophytes can be utilized for environmental cleanup. Many halophytes are hyper accumulators of different heavy metals and salt. 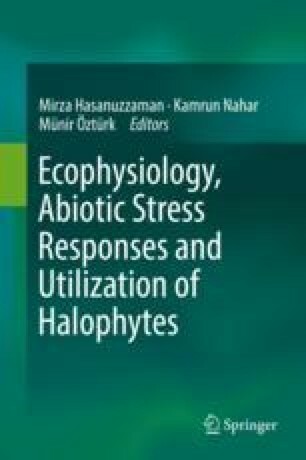 In this chapter, we discussed prospective use of halophytes for their economic importance as well their potential implications for environmental cleanup.